Our current way of living is based on an unsustainable amount of consumption, a good deal of which is unnecessary and creates a huge amount of waste. It’s also exploitative of other people and depletes our planets resources. Watch the great film ‘The Story of Stuff’ for 20-minute, fast-paced, fact-filled look at the underside of our production and consumption patterns. Much of what we buy is transported long distances and eventually ends up in landfill. But what’s the alternative – we all need things, and most of us don’t wish to live a hair shirt wearing, fun and beauty-deprived existence? One solution is to make, reuse and ‘upcycle’ things ourselves, and in doing so to revive some of the lost skills of our elders – sewing, knitting, embroidery, stained glass, natural home made cosmetics and other forms of craft. In this way we can have the best of both worlds – beautiful and individual items, without costing the planet. See ‘Remade in Brixton’ for some inspiration. In 2012 we ran monthly craft sessions on knitting, sewing, and making home made herbal beauty products. 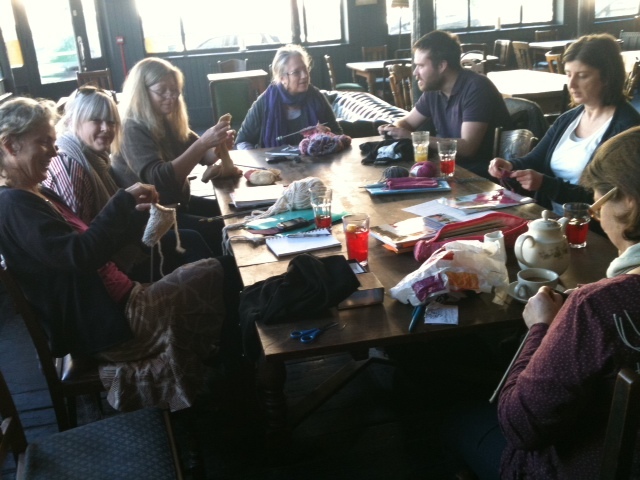 In 2013 we will continue our regular knitting sessions, held on the last Saturday of every month in the Star pub, Chester Road, N19. Sessions run from 1pm-4pm and beginners and children are welcome. This year we will also be teaching children at the Holly Lodge after school club to knit, and we will run several workshops on sewing, vegan making, and cosmetics making at Highgate Newtown and Holly Lodge community centres.We also hope to hold a ‘Restart Party’ where anyone can come along with broken electrical equipment and get it fixed for free. See our events page for updates, and please post any ideas or links below. Our next session is on Saturday 28th April, 1pm-4pm, in Highgate Newtown Community Centre sewing room. We’re going to make plant labels, and here are some of our ideas so far. Please add any you think of.